It is possible to connect to currently running or finished execution of a job. The Connect to Job action will open the running graph with current tracking information and log console, and show the job hierarchy in Execution view. Run ID - run ID of the job. 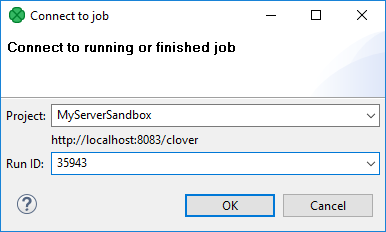 It can be obtained from a CloverDX Server Console (in the case of a server job). Details of the view on executed graphs are described in Execution Tab.